Late Wednesday, the Department of Justice waived its enforcement of the non-disclosure agreement binding an FBI informant to withhold his first-hand account from Congress of the corruption surrounding President Barack Obama’s approval of the 2010 deal, which gave the Russian energy company Rosatom controlling interest in 20 percent of America’s uranium deposits. At the time of the deal, Hillary R. Clinton was the secretary of state and her husband President William J. Clinton was meeting with Russians, including President Vladimir V. Putin and bankers and clients of the Russian bank Renaissance Capital–a speech and meeting for which he was paid $500,000. “As of tonight, the Department of Justice has authorized the informant to disclose to the Chairmen and Ranking Members of the Senate Committee on the Judiciary, the House Committee on Oversight and Government Reform, and the House Permanent Select Committee on Intelligence, as well as one member of each of their staffs, any information or documents he has concerning alleged corruption or bribery involving transactions in the uranium market, including but not limited to anything related to Vadim Mikerin, Rosatom, Tenex, Uranium One, or the Clinton Foundation,” Sarah Isgur Flores said in a statement. Chairman of the Senate Judiciary Committee Sen. Charles E. Grassley (R.-Iowa), long considered the most aggressive protector of whistleblowers on Capitol Hill, has asserted that the Justice Department, as a part of the executive branch, has no right to bind individuals to keep information from Congress. This release by Justice allows the informant to testify before Grassley’s committee, as well as the House Oversight and Government Reform Committee and the House Permanent Select Committee on Intelligence without with either Congress or the Executive to cede constitutional turf or pride. 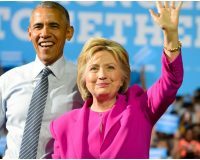 In an Oct. 17 article, The Hill reported that the FBI had an informant inside the machinations amongst Russian agents, Obama administration officials and the Clinton Foundation as the Uranium One deal progressed. Former congressman Michael Rogers, the chairman of the House Intelligence Committee at the time of the Uranium One deal told The Hill he was never notified by the Obama administration about the investigation into the deal–even as many lawmakers were raising concerns publicly about the transfer of the uranium to foreign control. Rep. Ronald D. DeSantis (R.-Fla.), a member of the House Oversight Committee and the chairman of that committee’s National Security Subcommittee, Tweeted his approval of the DOJ action rautshortly after it was announced.